Attention Information on access has changed see below. This link is an alternative trip in the area, Hedge Creek Falls. Mossbrae Falls is located on the Sacramento River in Dunsmuir, CA. The falls are unique as they appear out of the side of a hill and stretch for about 200'. Mossbrae Falls is not officially in any park or public land, in fact to reach the falls you technically have to trespass on railroad property. Now I do not endorse trespassing and caution strongly against walking along active railroad tracks but currently that is the only way to reach the falls. I have read that both the Town and the Railroad are aware of people using the tracks to access the falls and are working on an official less dangerous trail, but as of today it has not been completed. Dunsmuir is located about 40 miles north Lake Shasta on I5 and about 7 miles south of Mt. Shasta. Additionally the McCloud falls are just 20 miles east on Highway 89. To reach parking for the falls from Dunsmuir Ave turn onto Scarlet Rd. Scarlet is easy to miss if you are coming from the north. At the beginning of Scarlet Way is a stone and iron arch way, it looks like a private drive but it is a public road. Stay straight and cross the river, park in the dirt lot just across the tracks. From the Dunsmuir Chamber of Commerce: As of 8/10/10: Mossbrae Falls Trail is CLOSED. 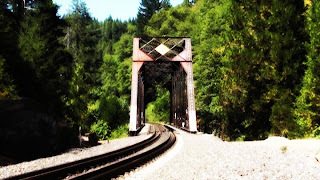 Closure with Union Pacific to redirect Mossbrae Falls trail from Hedge Creek Falls. I just found this out 6/26/11, I will post new info ASAP. Again, I must warn you of the dangers and legalities of walking the tracks. The Falls are about 1.2 miles north of the parking area. If you choose to walk along the tracks it is a long 1.2 miles walking along the loose rocks that line the tracks. For most of the way there is a trail of sorts, more of a packed pathway that has been made by people coming and going to the falls. About 200' or so before you reach a rail bridge there are a few trails down to the river, head down one to the bottom and take in magnificence of Mossbrae Falls. The water springs from the side of the hill, it is first visible about 35' up and makes its way down along moss covered rocks and vegetation. The Falls are about 200' long, at spots the water free falls into the passing Sacramento River, in other spots the water simply just runs down the hill. It is located at a bend in the river and has a concave shape making the sound of the crashing water pretty intense. This is a popular spot I was here on weekday during summer and there where over 20 people visiting the falls. People where laid out on the rocks and wading into the cold snow melt river. If you are going to be in this area and you are in need of some outdoor gear or to arrange a guided trip to other great locations in the Shasta area, check out the newly (5/25/12) opened McCloud Outdoors & Gear Exchange. Mossbrae Falls is definitely worth visiting. It is a very beautiful and spiritual place my video camera can only give you an idea of what this place looks like, you defiantly have to see this in person to truly appreciate it. Hopefully an alternative path to the river will be available soon. There are a few additional resources below, be safe and enjoy your trip.